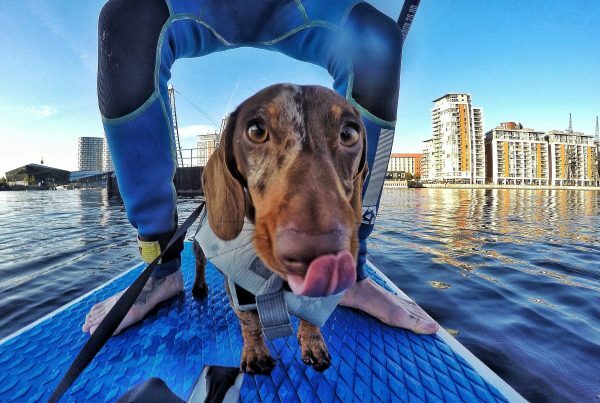 How many of us when going out for dinner and bringing our dogs along have found them staring at us from the the side of the table with puppy eyes, maybe even adding that head tilt from their repertoire, making us feel guilty that they did not get anything from the menu. 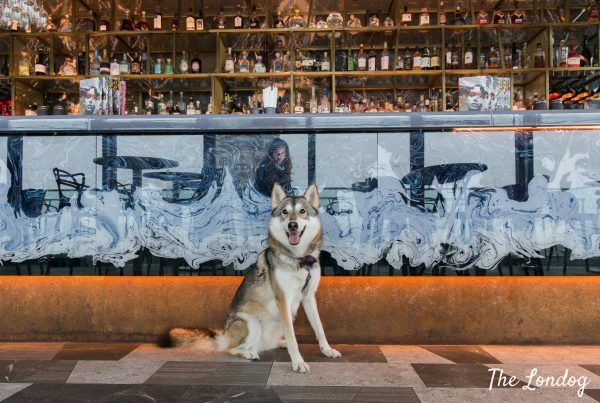 Well, dining with your dog has just become more literal and, from your dog’s perspective, more fair: the Ace Hotel London in Shoreditch has launched a permanent dog menu, the Pup’s Gourmand. We were recently invited to try it and this is what we thought. 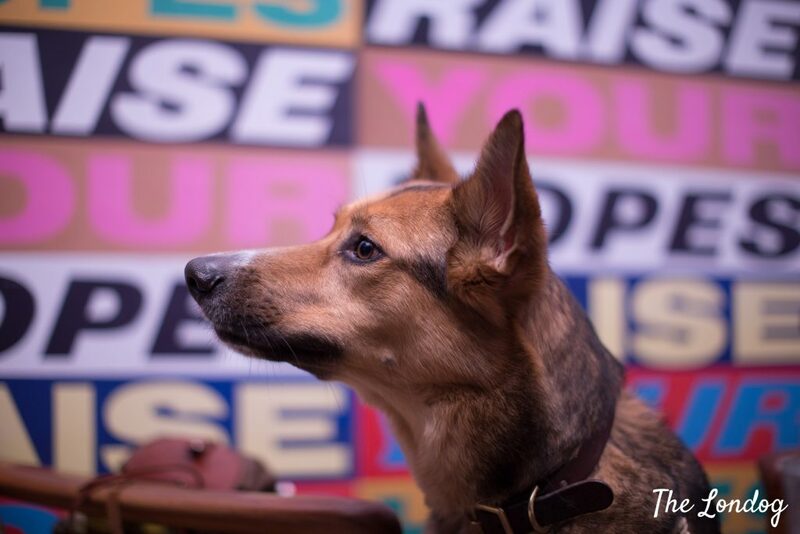 Ace Hotel London’s newly launched Pup’s Gourmand menu was presented to the public on 14th March with an official event. We couldn’t attend the official launch, so they kindly invited us over to try it on another date. So on a weekday evening, my husband, Argo and I popped over for a real pet dining experience. They had reserved a table for us in the Lobby, a low table with two comfortable armchairs and plenty of room for Argo. 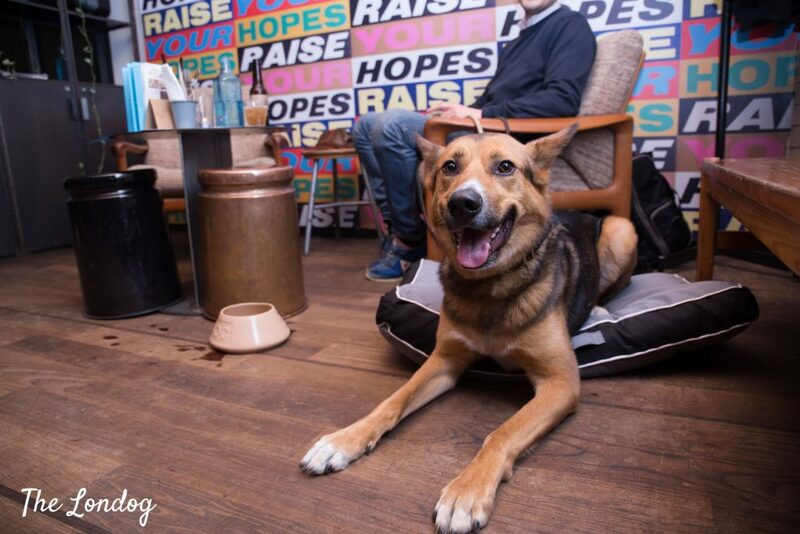 As soon as we sat down, a waitress brought Argo a bowl of water and shortly after he was also treated with a dog bed. He sniffed it with interest and settled on it (as usual, he was a bit oversized for the bed). He received so much attention not just from the staff, but also from guests at the bar; everyone was stopping by for a cuddle. On our table we found the Pup’s Gourmand menu, which includes five fresh, home cooked dog food bowls taken from the book Feed Me: 50 Home Cooked Meals For Your Dog by Liviana Prola (Amazon affiliate link; book also available to purchase at the counter at the Ace Hotel London). It was a difficult choice between Cod and Potato Casserole; Pasta Lamb and Zucchini; Barley, Turkey, Beef and Carrots; and Beef Stew with Rice and Apple. Apparently the Barley Turkey and Beef proved most popular at the launch event with Beef Stew a close second with the dozen or so dogs at the launch. Unsurprisingly, Argo had come with good appetite (not a problem, considering that it happened more than once that me and my husband fed him dinner twice, and nobody could tell he had already eaten). He is not a fussy eater, so we weren’t worried about him disliking any dish, however, he has some food allergies, so we excluded the dish with turkey. We were debated between the Cod and Potato Casserole, which looked a great alternative for sensitive stomachs, as it was grain-free and other allergens free, or the Beef Stew, with rice, parmesan, lard and apple. Considered that cod and potatoes is something we cook for Argo on special occasions at home, we opted for the Beef Stew, although it would have been so nice to make him choose. A very special and yummi treat. As it sounded a bit as the law of retaliation to watch him eating his food while fasting, we ordered food for us humans too (Ace Hotel burger for my husband, gnocchi for me). 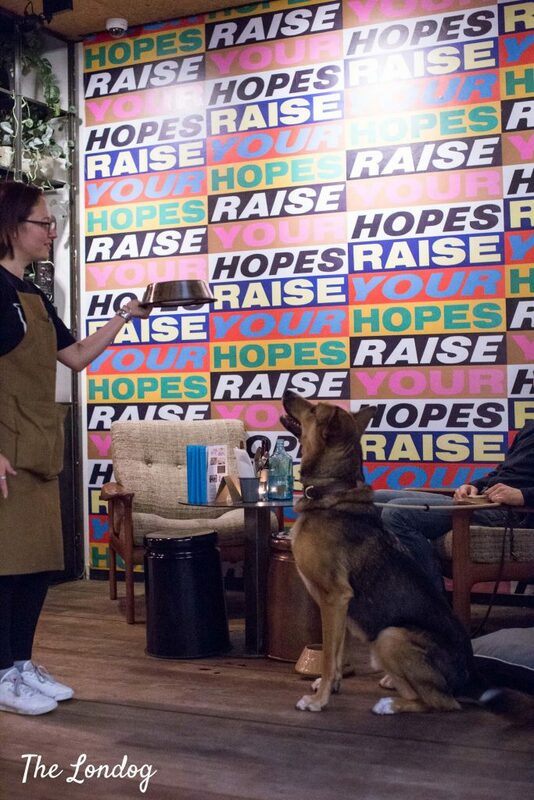 The service was fast and the waitress soon arrived with a large dog bowl. 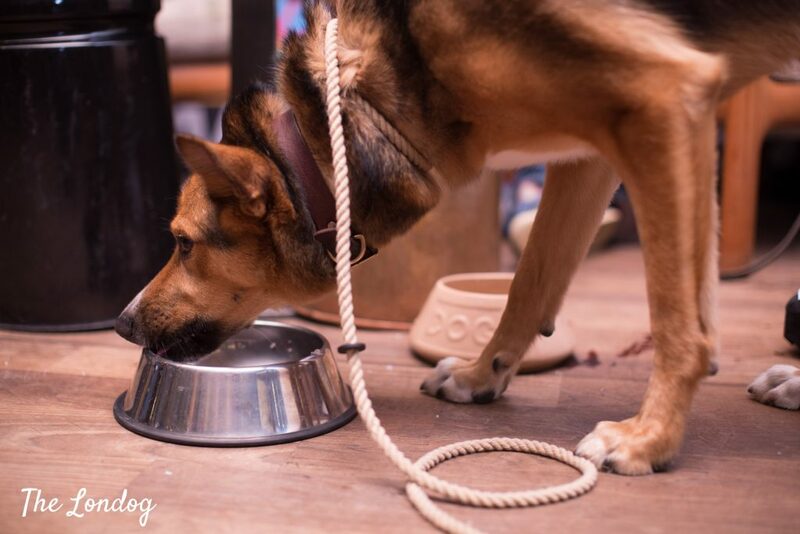 Argo immediately realised who it was for and after looking at the bowl with drools waiting patiently, he stood up on his hinder legs to sniff it out properly, before getting back in position for dinner to be served. As soon as he was given his release command he woofed down the bowl, licking every inch of it to make sure that no single crumble had been missed. 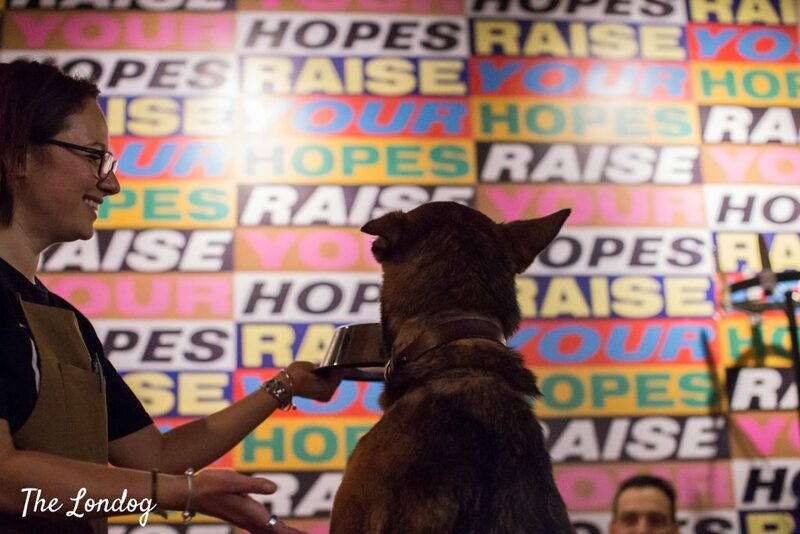 This was our first ever proper dog dinner and I was surprised how good I felt about giving him such a special treat. He licked his whiskers so content afterwards. The experience was great for us humans too, not just the highlight of watching him devouring his dish and enjoying our meal, but also spending some time to chat and relax after a day at work. 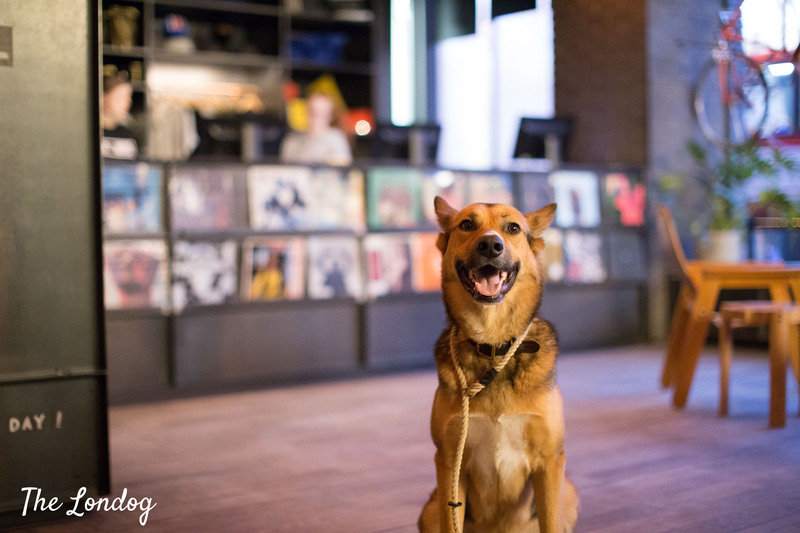 Probably the only recommendation visiting with your dog would be to avoid evenings where possible, as they have regular DJs and live music, which we hadn’t thought about. On the weekday evening we visited a DJ was playing ambience/chill music, but as the evening went on it seemed the volume was a bit loud for a dog’s hearing. Argo didn’t seem to care much, as he was completely enraptured by the DJ’s hamburger laying on a plate placed on the bookshelf next to the DJ’s post, but that would be something I would consider when visiting another time. It is not difficult to find a suitable time, as the Ace Hotel London confirmed that they serve the Pup’s Gourmand menu any time the Lobby is open, 7 days a week, and anyway ideally between 7am-7pm (while we arrived at 7pm the day we visited, so it was already evening/late) and DJs start at 7pm during the week and 6pm Friday to Sunday. 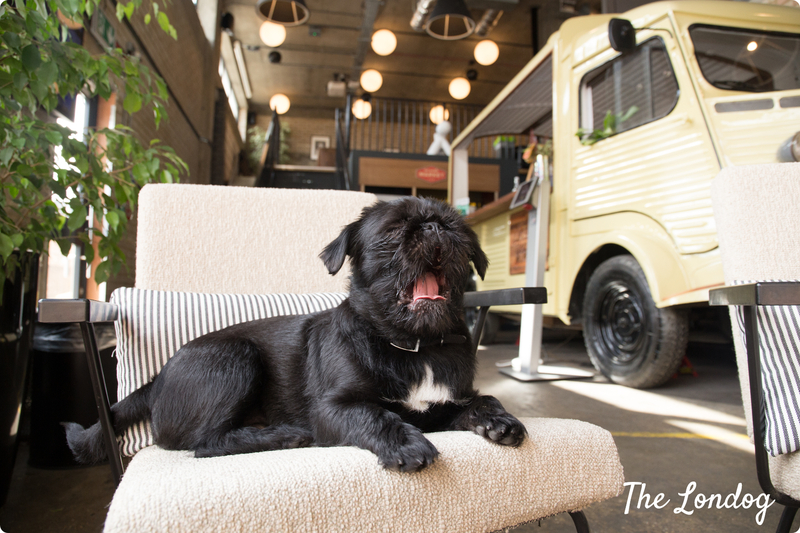 Ace Hotel London has been a dog friendly hotel looking since opening (their previously hosted a few Dog Eat Dog canine catwalks one of which we attended back in 2016 and even interviewed their office dog Pofi in the Office Dog Series). 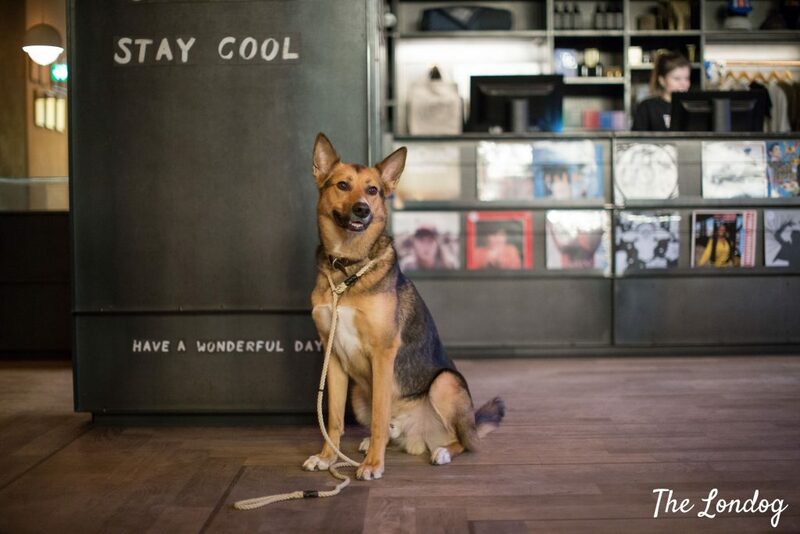 The new menu seems another great way of welcoming dogs to enjoy their cool space. We very much enjoyed it, and especially Argo was overjoyed by the experience, so we will definitely look go back and make him try the Cod and Potato Casserole! 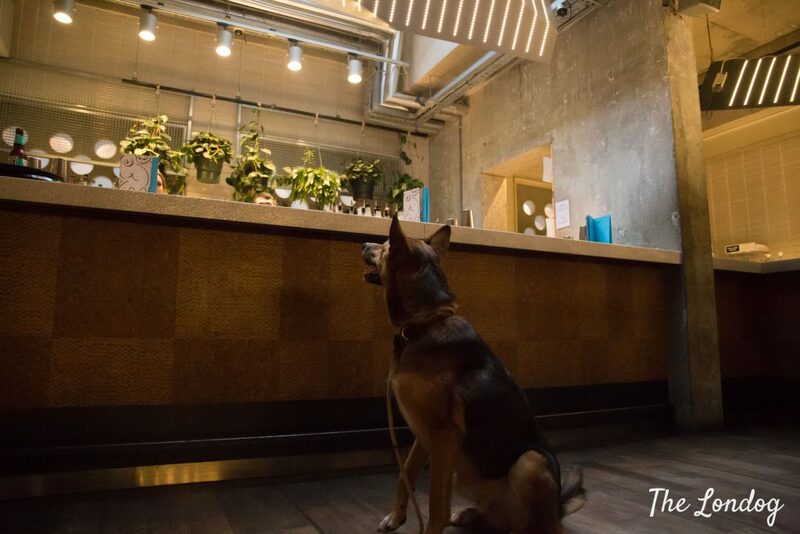 The dishes on the dog menu are reasonably priced at £5 each, so it is a great one to put on the list even if just on a walk in the Shoreditch area. How to get there: The closest station is Shoreditch High Street Overground station, alternatively you can travel by tube to Liverpool Street or Old Street stations and walk from there. 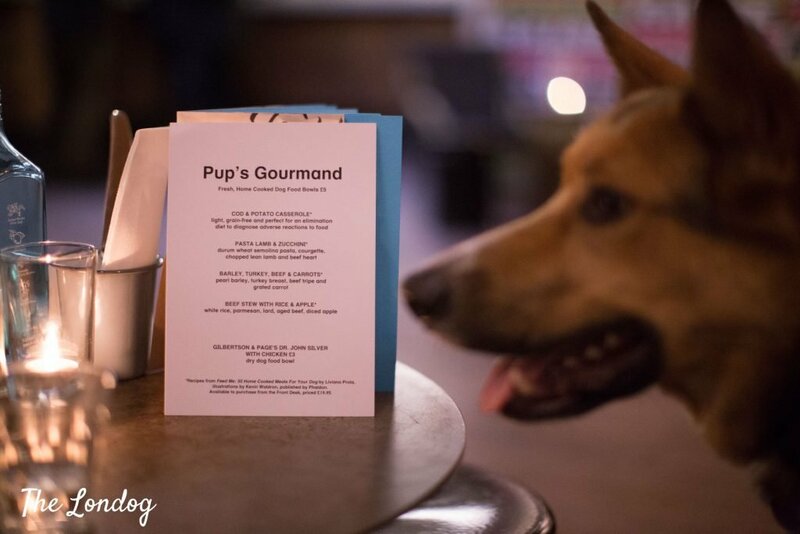 Disclosure: we were invited to try the Pup’s Gourmand menu and were offered dinner. This post is in an independent review of our experience.